Airport Sheremetyevo is the second airport of Russia. 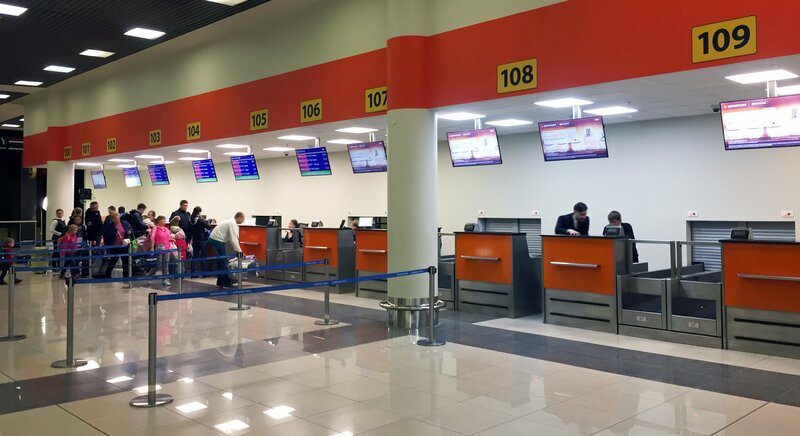 This airport is situated 29 km from Moscow and consists of 5 different terminals. Each year, more than twelve million people are transported. In May 2016, they started with the construction of a new terminal and the opening has taken place in May 2018. A reconstruction of the “old” terminals is planned for the coming years. In this new terminal you will find several arrival- and departure halls, check-in counters, restaurants, bars, shops, etc. Everywhere you will find displays, think about single solutions on the ceiling and on the wall, but also about big video walls. All these displays are mounted with Vogel’s products. 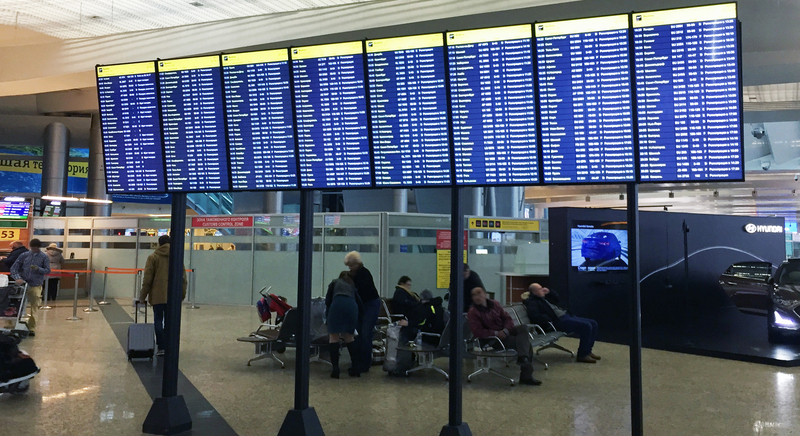 A challenge was the placement of 16 displays on a starting height of 230 cm from the floor, a free-standing solution back-to-back, in a public area where traffic content will be showed. Because it is a public area, the solution should be very sturdy, solid and safe, that’s the reason why they chose Vogel’s. As usual, Vogel’s products are TÜV-certified, which means it can hold up to five times the specified weight, and come with a 5-year material- and manufacturing error warranty. Vogel's supplied mounting solutions for about 400 displays divided into 42 inch, 55 inch displays but also 83 inch displays. 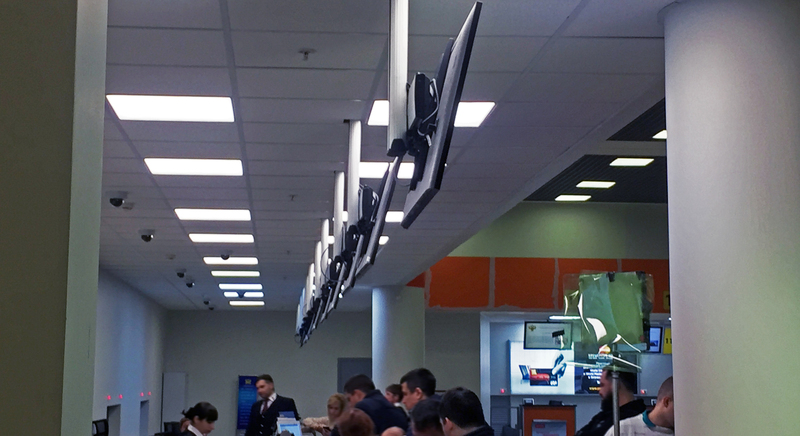 In the new departure hall of this Airport about 400 displays are mounted. 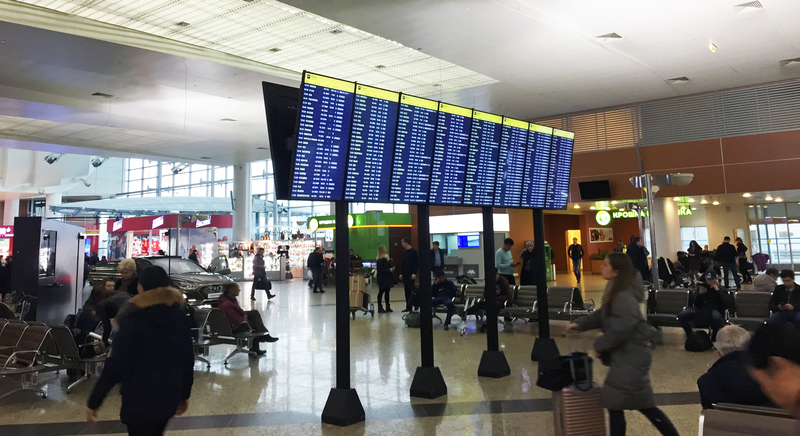 All mounted in a different way, think about single solutions, big video walls, but also a stand-alone solution with 16 displays on a starting height of 230 cm, at a certain angle. This was really a challenge, but with the Vogel's Connect-it universal video wall solution together with a dedicated floor base we could manage it. In addition to the Connect-it video wall solution (PUC 29xx Series) also the Connect-it modular ceiling mounts (PUC 25xx Series) are used. The larger displays are installed with Vogel's PFW 6851 (display wall mount). Our Russian importer, company ModulIT from Moscow, managed this project together with multiple installers. If you want more information, please contact us.